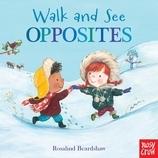 This elegant board book takes very young readers on a journey to explore opposites.The talented Rosalind Beardshaw’s beautiful illustrations and visual storytelling follow two children on a wintry walk through the countryside, bringing a narrative feel to this simple book for very young readers. The fourth in a series of seasonal concept books, this is a board book to visit again and again. Rosalind Beardshaw is theillustrator of many books for children, including The Fairiest Fairy, Box, and Just Right for Christmas. She loves creating new characters, especially if theycan be based on her dog, Basil. She lives with her partner and her children in York, England.